Heading for Chatuchak Weekend Market – ตลาดจตุจักร – on the skytrain on a Saturday morning, I chuckled to myself, “I’m going to ‘church! '” It’s an inside joke Michael and I shared with my mother about a decade and a half ago when she was in her mid-70’s and still very active and mobile. And what a ‘church’ it is, well-attended by people of all persuasions, happy and enjoying their time at the huge bazaar filled with sights, scents, sounds and delightful tastes where there is something for everybody. 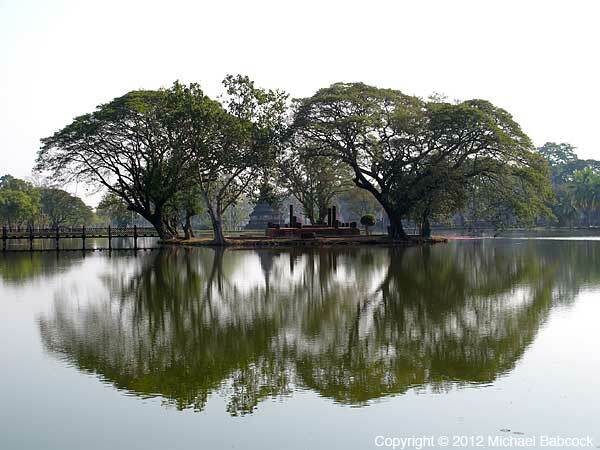 It’s our own kind of earthly heaven and a great way to spend a day without any goal. This is the third June in a row that I’ve come to Thailand – not for business but to visit mother who is now in assisted living at Mission Hospital in Bangkok. In between trips to see her, I try to squeeze in visits to some of my old haunts to check things out and see what changes have taken place. 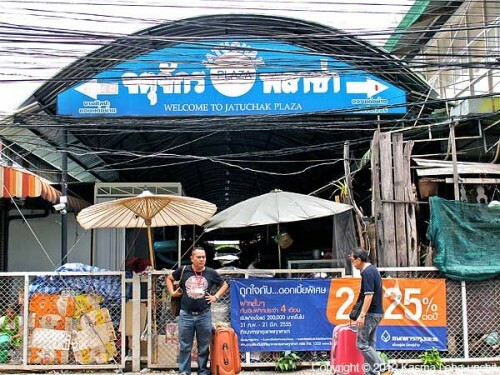 So today it’s Chatuchak* (see below for inconsistencies in the spelling of the market’s name) – Southeast Asia’s, if not the world’s, largest bazaar. I like to arrive early as the shops are just opening and many of the stalls are still being set up. It can get very hot here by mid-day, even during the cool winter months, when the crowds swell and the narrow aisles get stuffy. Although shaded, the ventilation is poor with the cubicle stalls packed so closely together and spilling onto the aisles. But it’s what makes this bustling bazaar exciting!. By early afternoon, the heat and crowds are usually more than I can bear and my feet are achingly sore from hours of walking about, especially if I have acquired a heavy load of goodies to carry. Then it’s time to take an air-con cab home. This June is especially hot and I’m already soaking wet with sweat by mid-morning. An iced cappucino made to order from freshly ground coffee beans from one of many stalls is my first attempt at cooling down while at the same time getting a jolt of energy to continue on. Much better than any Starbucks can make! A half hour later, it’s time for an ice-cold roasted coconut! Very refreshing and rejuvenating! There’s no shortage of choices of cold drinks besides ice-cold bottled water. The problem is there are too many choices! Grass jelly is cold and invigorating, made with an herb that has cooling properties for this hot, steamy weather. But wait a minute, there’s the tart, thirst-quenching roselle drink. made from a red hibiscus flower. Next to it is “bua bok” and I love “bua bok!” (pennywort, also labeled “gotu kola” – a very good herb for the capillaries in the brain and for internal inflammations). There’s also chrysanthemum with stellar cooling properties, especially when I’m this hot! 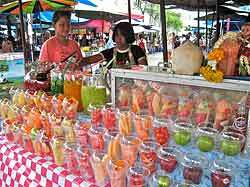 A few steps further, my attention shifts from the innumerable jars of herbal drinks to a colorful stall with neatly stacked covered plastic glasses filled with various kinds of fruits. 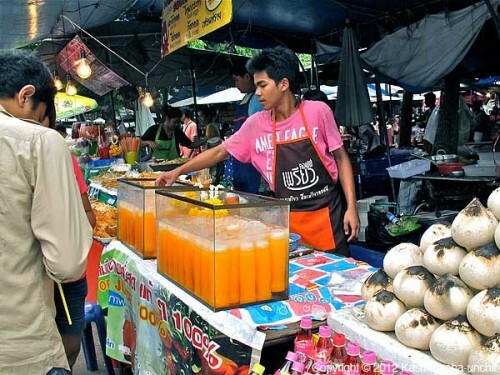 For a very cold and refreshing fruit shake, all one needs to do is select a glass with the fruit of choice for the vendor to put in a blender with ice and some syrup. I settle for a strawberry shake and it’s so cold my chest begins to ache! The annex to the main market, called Jatuchak (their spelling) Plaza, has wider aisles and taller roofs and is less crowded, so I wander in that direction. It’s not quite as interesting a place to “window” shop though unless you are looking for home furnishings. I wish I could bring some of the beautiful teak furniture home but it’s too much trouble to deal with shipping. Beyond the plaza is the air-con JJ Mall which opens seven days a week unlike the main bazaar that’s open mostly only on weekends. I’ve never been in there before and decide to check it out – at least I can use some cooling off. It turns out to be a less-than-desirable move as the mall is waaaaayyyyy too boring. So after I’ve cooled off enough, I head back to the main bazaar area. All along the walk from main bazaar to plaza to mall, there’s no shortage of cold beverages and tempting foods to cool off and fill up on. 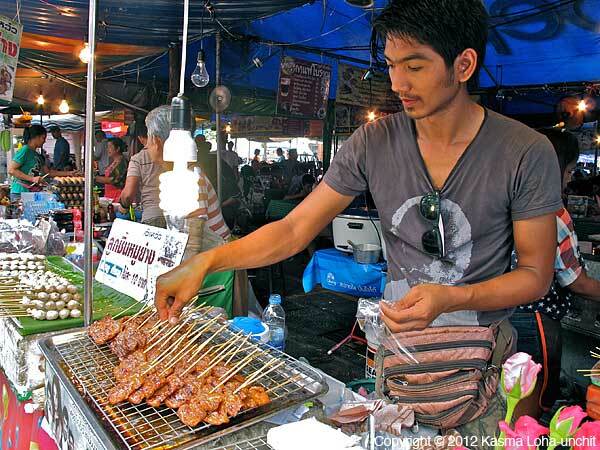 For a quick bite, the grilled pork on skewers is delicious! 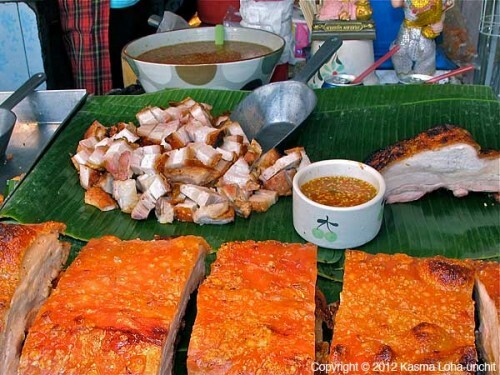 So is the crispy skin roasted pork belly with hot dipping sauce! There are lots of other quick eats that don’t require sitting down and wasting precious shopping time. 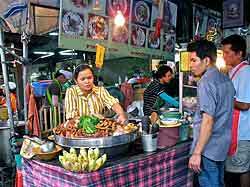 For those whose feet are tired and prefer to sit down, there are plenty of stalls with sitting areas all around the bazaar offering various kinds of noodle and rice dishes, salads and grilled foods. Some are small and get very crowded by the noon hour. 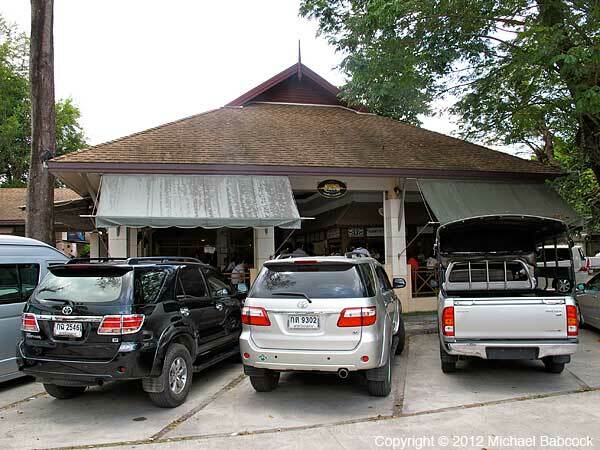 For cool, air con comfort and more refined decor, there’s, of course, Toh Plue (see Michael’s blog on Toh Plue Restaurant in Bangkok.) 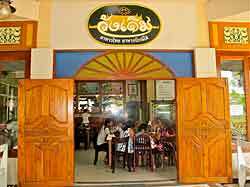 where the food is good but comes at a price for the comfort. It’s well worth it if you have the time. On this trip, I forego sitting down for a leisurely meal by myself. After all, all along my walk around the bazaar I’ve acquired a big selection of irresistible ready-made foods to keep me well-fed for days. 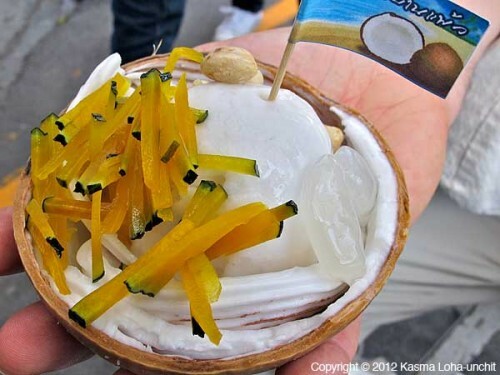 But before I leave, I cannot miss out on the fresh-made coconut ice cream with a choice of toppings, including peanuts, palm seeds, cooked pumpkin, young coconut meat and sweet corn. 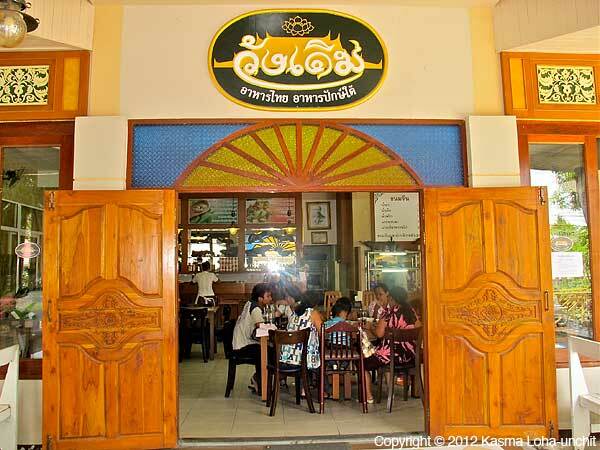 I sit down on a stool in front of the stall shaded by patio umbrellas and savor every mouthful with great satisfaction. It’s my last attempt to cool off in this tropical heat before hopping on a cab to head home, leaving my earthly “church” in a state of contentment. 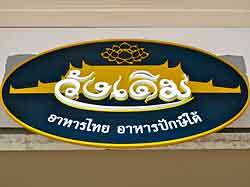 * The official spelling of the market’s name according to the signs in the market is “Jatuchak” but this presents an inconsistency as the same Thai alphabet is used to begin both the first and third syllables. 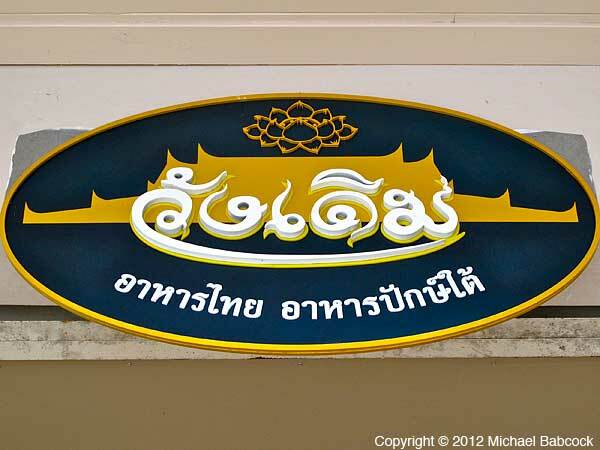 So if the letter “j” better represents the Thai alphabet’s sound, the spelling should then be “jatujak.” I prefer to use “ch” to approximate the sound of the Thai alphabet which is neither “j” nor “ch.” The particular Thai alphabet is often represented by ‘ch” in many other instances in proper names. For a very cold drink, customers select a glass with the fruit of their choice which the vendor empties into a blender with ice and some syrup to make a frosty, non-dairy fruit shake. Bottles of fresh-squeezed tangerine orange juice sit in ice water to keep cold. To the left is a pile of roasted young coconuts. 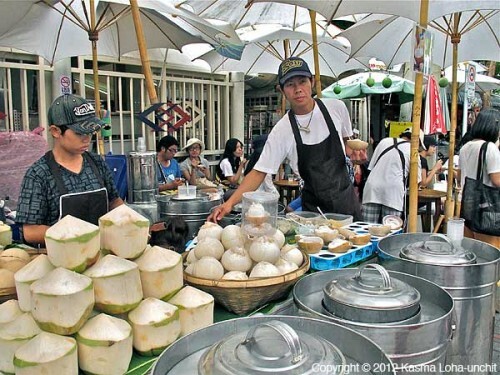 Fresh young coconuts, roasted coconuts and coconut ice cream are all great on a hot day to rejuvenate tired bodies and give a boost of energy to shoppers. Coconut ice cream, served in the half shell of a roasted coconut, comes with a choice of toppings, including cooked pumpkin, palm seeds, roasted peanuts, young coconut meat and sweet corn. Not to be missed! Popsicles of flavored juices are made fresh on the spot in a popsicle maker. 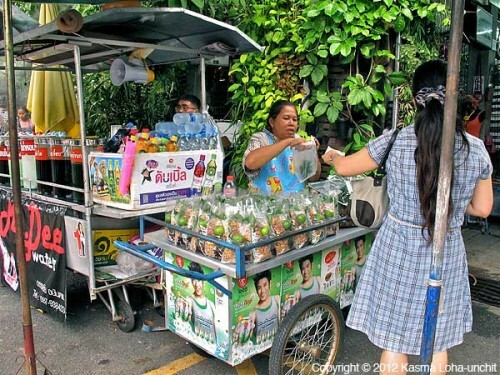 A pushcart behind a "miang kum" vendor offers several different kinds of thirst-quenching and cooling beverages made from herbs, fruits and flowers, including roselle (hibiscus flower), pennywort (gotu kola), chrysanthemum, grass jelly and bale fruit. A pile of delicious-looking pineapples is irresistible on a hot day! Grilled marinated pork on skewers is an easy way to have a bite without needing to sit down and waste precious shopping time. For carnivores, crispy skin roasted pork belly is hard to resist. 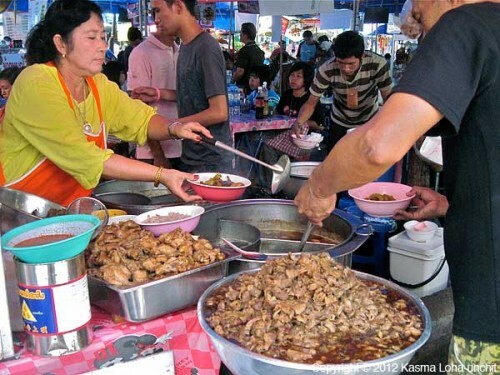 A stall selling rice dishes includes the common and well-loved stewed pork leg rice. 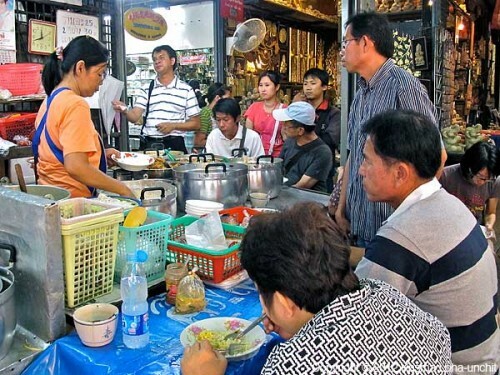 Customers wait their turn for the few seats around a "kanom jeen" stall where fresh rice noodles are served with a choice of spicy curries. A soup noodle vendor offers a choice of pork, beef and chicken toppings in front of a large seating area shared with other food vendors. 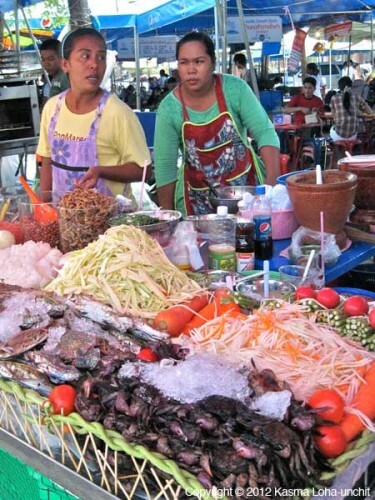 These two northeastern women make different kinds of hot-and-sour salads in their large wooden mortars, including green papaya salad with a choice of fresh, dried, salted, pickled and dried seafoods. 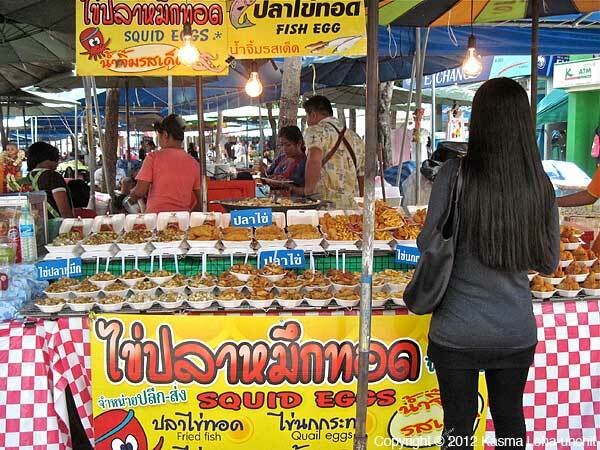 Many of my cooking students who have cleaned squid in my kitchen should know how tasty squid eggs can be. They have a texture and flavor more like some kind of meat than fish. 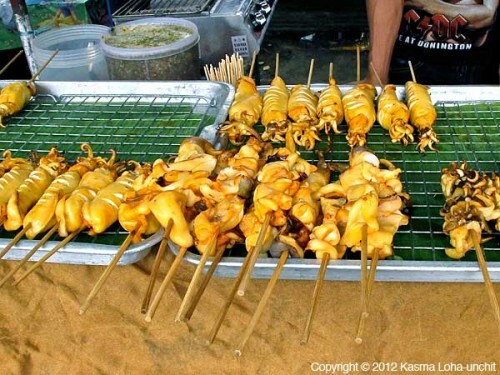 Marinated grilled squid on skewers come whole (with egg sacs still inside) and in threaded pieces. 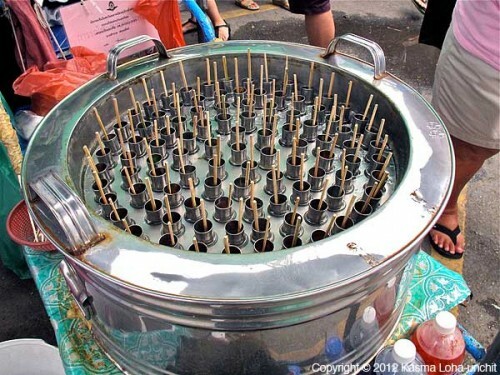 Have you ever had fresh-fried potato chips on a skewer? 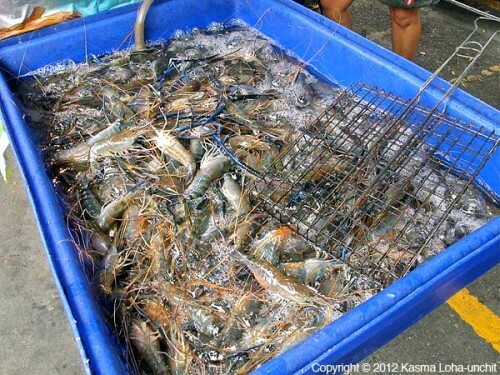 Live fresh-water prawns are grilled to order for customers. 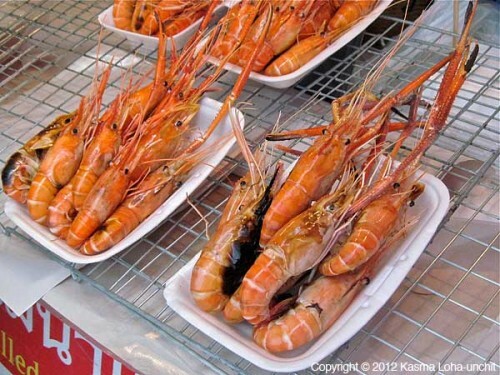 Freshly grilled, whole fresh-water prawns draw customers to this stand. 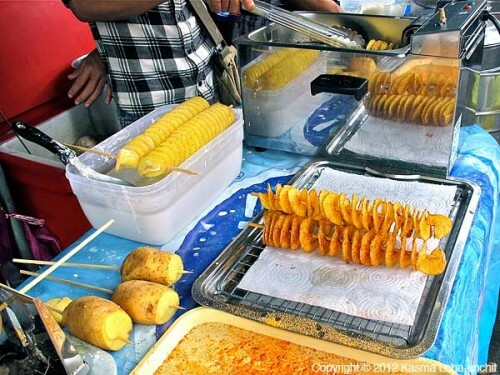 The covered walkway outside JJ Mall is lined with tempting treats being made right on the spot. 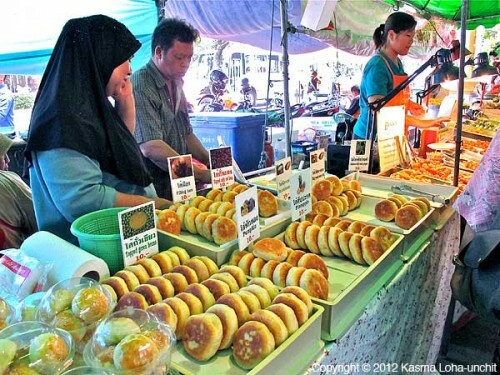 These round pastries are stuffed with various fillings, including taro, pumpkin, mung beans, red beans and pineapple. Pork and shrimp dumplings are steamed on a special tray along with stuffed chive and bamboo shoot cakes. 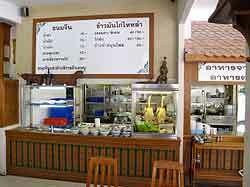 For health food lovers, this stall makes delicious spicy salads and stir-fries with shitake mushroom stems – an "in" food trend of the health food movement. 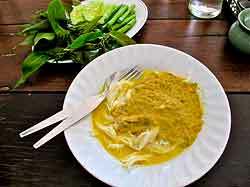 This yummy-looking curry, made on the spot with featherback fish dumplings and bamboo shoots, is my favorite kind of green curry. I couldn't resist buying a bag to take home for dinner! 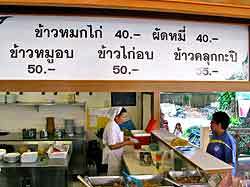 The Wikipedia entry on Chatuchak has some information on the market’s history and how to get there. Here are just a few of my favorite moments last year from Kasma Loha-unchit’s 19-day trip of Bangkok, central and northern Thailand. 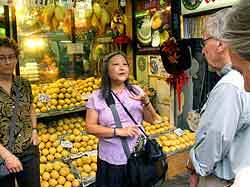 Kasma’s trips get you off-the-beaten track to places she has discovered over more than 25 years of leading trips. The hard part in writing this blog was picking only a few moments! Kasma’s 28-day Trip A visits most of these places as well. 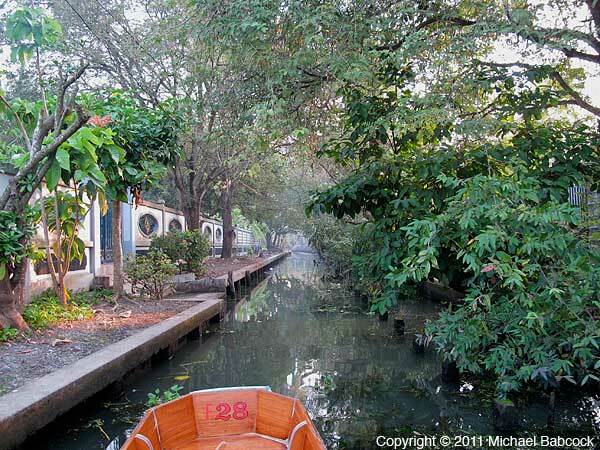 Canals of Bangkok & Thonburi: On the second day of this trip, we took a ride around the canals of Bangkok and Thonburi. After a stop at the Royal Barge Museum, we headed onto the canals and within minutes it was hard to believe that Bangkok was just a short distance away. 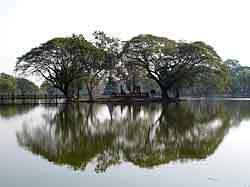 We saw life along the water and stopped at some temples along the way. 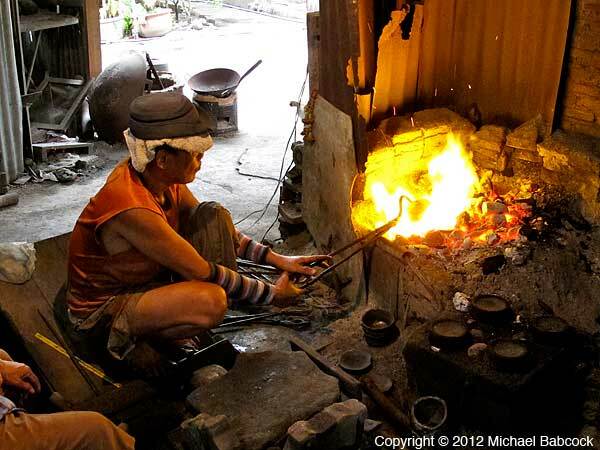 One of the highlights was a visit to a bronze factory where they make bronze ware in the traditional manner: beautiful, hand-crafted bowls, plates and drinking cups. The picture to the right can’t do justice to the feeling you get at the factory. 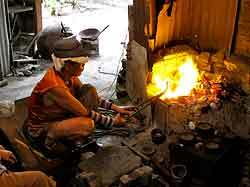 It shows one of the workers holding a piece of bronze ware directly in the fire. It’s quite dark, except for the light from the fire, which casts off a daunting heat: you wonder how the workers can stand to be so close to the fire all day. Then there’s the sound: once the piece is pulled off the fire, the workers shape it with a hammer and there’s the dull klunk, klunk, klunk as the hammers from two workers hit the bronze over and over before it’s thrust back into the fire. 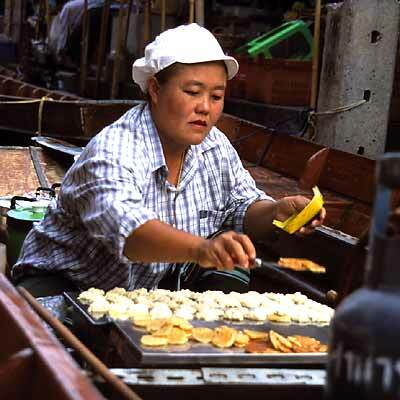 Damnoen Saduak Floating Market: Despite the fact that it is heavily touristed, I still absolutely love going to Damnoen Saduak Floating Market. 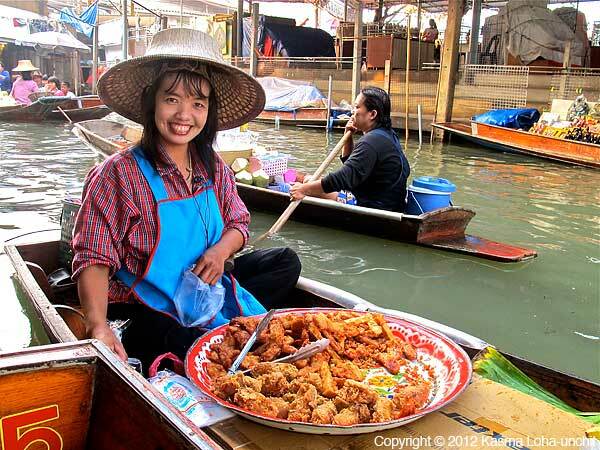 Although the pictures of floating vendors are a well-worn cliché, it’s exciting to see the lively, colorful boats laden with produce or carrying a kanom (Thai snack) vendor. Here’s the caveat: don’t go with a scheduled tour. You must get there early, before the tour buses arrive. On Kasma’s trips we always leave Bangkok around 5:30 a.m. so that we see the sunrise on the eastern coast and arrive at Damnoen Saduak just as it is still getting light. We get to travel on the klong (canals) virtually by ourselves. 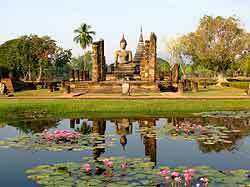 Historical Sites of Sukhothai: Once out of Bangkok, we pass through the historical heartland of the country, through Ayuthaya and Sukhothai. My favorite time here is the morning walk through the historical ruins of Sukhothai. We always get there right after breakfast when the light is just magical and wander around the ruins, which are all in one close area. There is a grace and beauty to the ruins there, reflected in the many ponds, often with water lilies adding a splash of color to the view. After the view from afar, we walk amongst the ruins where there are lovely details to be found on the walls: elephants, lions and graceful, walking Buddhas. You get a sense of what how beautiful Suhkothai must have been when it was flourishing in the late 13th and early 14th centuries. To the left we see one of the ruins in the early morning light. 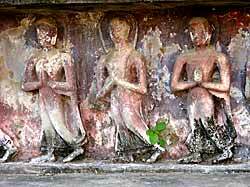 The walking Buddhas, to the right, are found on one of the temple walls. I can never resist photographing them; they are so utterly graceful. 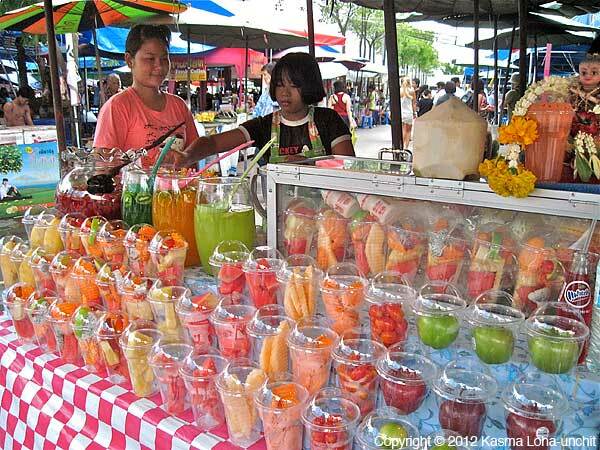 Sukhothai Market: Ahhh. The market walks. 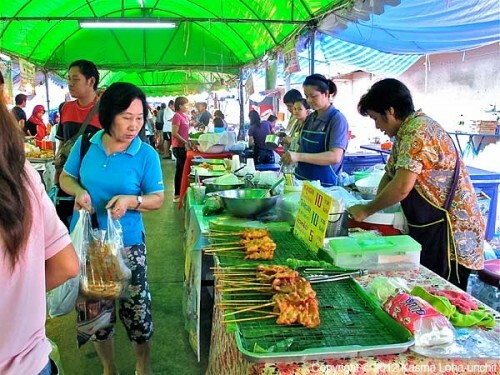 Whenever possible, we visit the lively Thai morning markets. 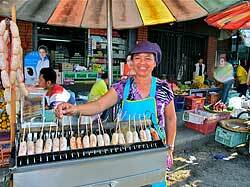 The Sukhothai Market is one of my favorites, in large part because of the friendliness of the vendors. Like most Thai markets, it’s colorful and lively with plenty of appetizing prepared food. This market is also where Kasma purchases large quantities (several kilograms) of beautiful, dried red chillies to bring back for use in her Thai cooking classes. One of our Wednesday photos showed these Dried Red Chillies in Sukhothai. 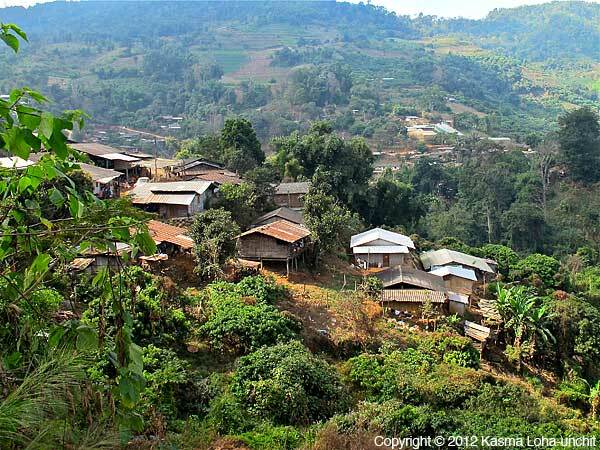 Hmong Village, Ceremony and Walk: What is the best part of Thailand? Without a doubt, the people. The only contact with the hill tribe in many other tours is often a village set up just for tourists. Kasma has been friends with people in one of the Hmong villages in the Mae Sa area (just north of Chiang Mai) since her first trip to Thailand in 1986. We visit a real village with a living culture, where most of the people are still farmers. 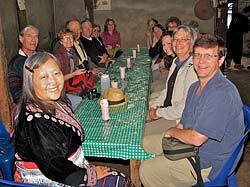 We are invited into Kasma’s friend’s home and given a welcoming ceremony by the village shaman. 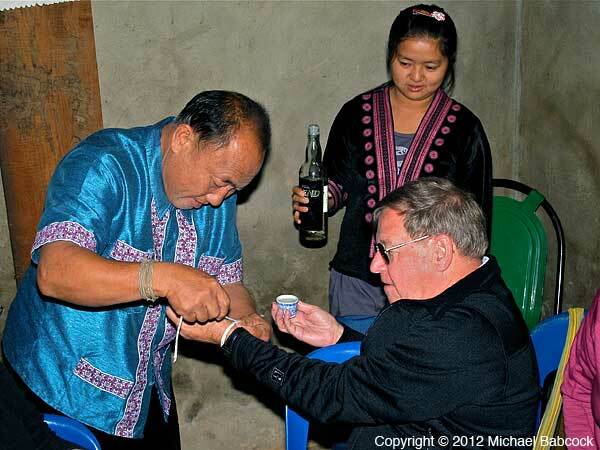 Protective strings are tied on each trip member’s wrist to be followed with a shot of Hmong moonshine to seal the deal. We then eat delicious chicken soup, made from gai bahn, which literally, “house chicken.” These are the very chickens we see running around the village: you want free range? These are free range. To the left we see the Hmong shaman tying a string on a trip member’s wrist. To the right is one of the Hmong mothers with child that we saw on our visit. The people really are the best part about visiting Thailand. 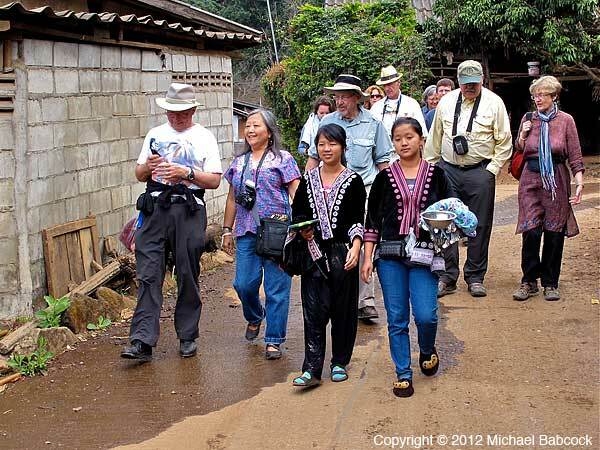 After our ceremony and the chicken soup, we take a walk through the village. Within a short while we’re a bit out of town and see views of the village, such as this one to the right, and of the fields. The two young Hmong women in the leftmost picture are the daughters of the family where the welcoming ceremony was held; Kasma has known them since they were infants. 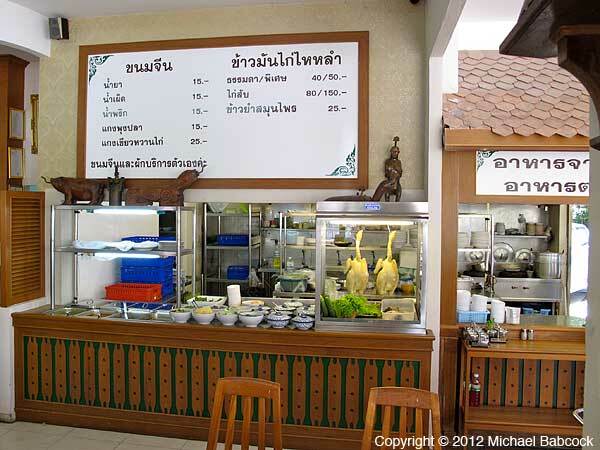 This blog continues in Thailand Trip – Favorite Moments, Part 2. 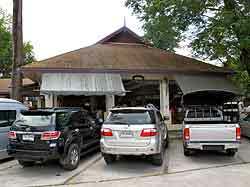 Krua Nakhon, a popular restaurant in Nakhon Si Thammarat recently metamorphosed into วังเดิม – Wang Derm Restaurant – at a new location. It still has the same signature dishes as before while offering an expanded menu. 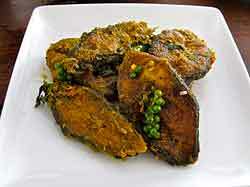 The food remains fresh, appetizing, absolutely delicious and highly recommended. 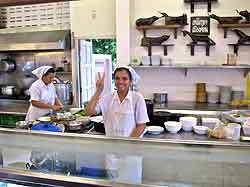 Thankfully, most of the friendly staff are still there. 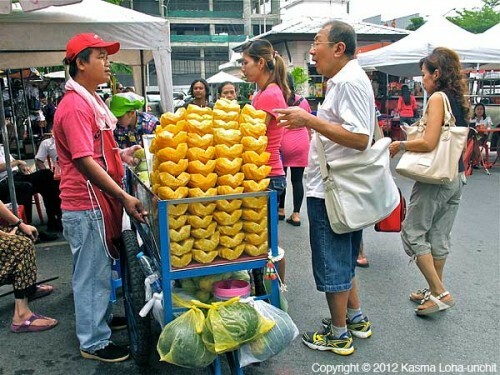 Krua Nakhon was situated in the heart of town; Wang Derm (which could also be transliterated as Wang Deum or Wang Doem) is located next to the Provincial Court. 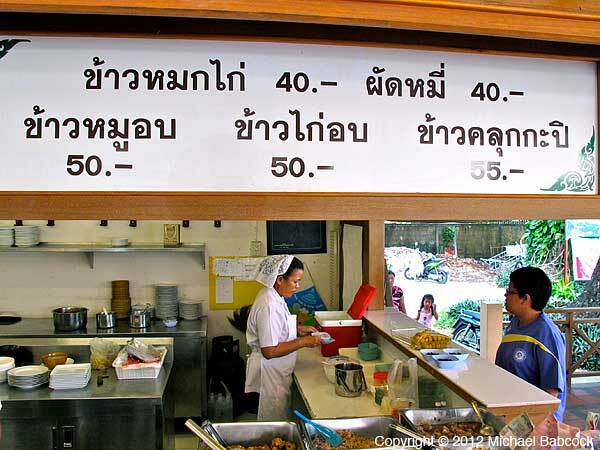 As the sign (to the left) says, under the name, it serves อาหารไทย อาหารปักษ์ใฅ้ – Thai Food and Southern Food (ahaan Thai and ahaan pak tai). 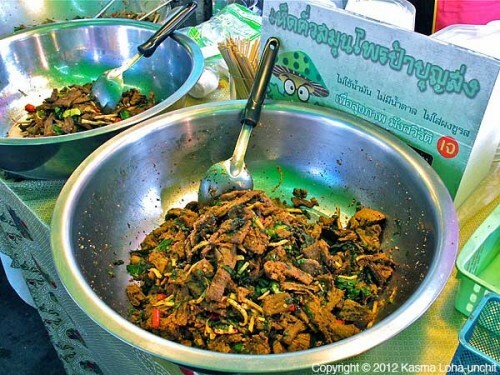 Two of my favorite dishes from Krua Nakhon, the southern specialties of kanom jeen noodles and khao yam salad are still available in addition to a wider variety of other dishes. 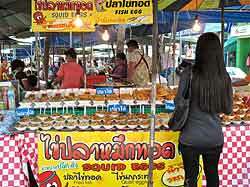 The photograph to the right shows Kanom Jeen Nam Ya – ขนมจีนน้ำยา – a popular southern Thai dish. Kasma translates it into English as “Southern-Style Rice Vermicelli Topped with Spicy Fish Nam Ya Curry Sauce.” Kanom jeen are a fermented rice noodle and are found all over Thailand; they are possibly the one noodle in Thailand that is not Chinese in origin. (They probably originated with the Mon ethnic group.) This particular dish is a southern variation. 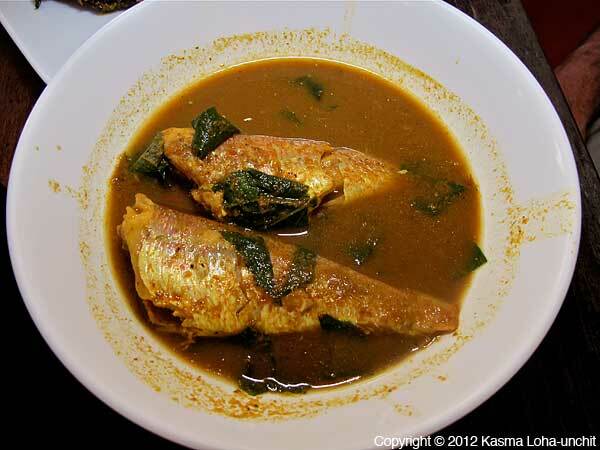 The nam ya curry sauce is made with flaked fish and is often very, very spicy. The only place I’ve ever come across this in the United states is at Kasma’s Advanced Set E cooking class. 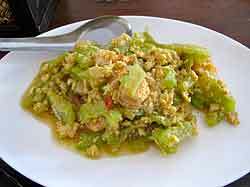 The left photograph shows “Southern Thai Rice Salad” – (ข้าวยำ) (Khao Yam) – a composed rice salad. The ingredients can vary depending on what is in season and what is fresh and available. To eat, you mix everything up together and enjoy. 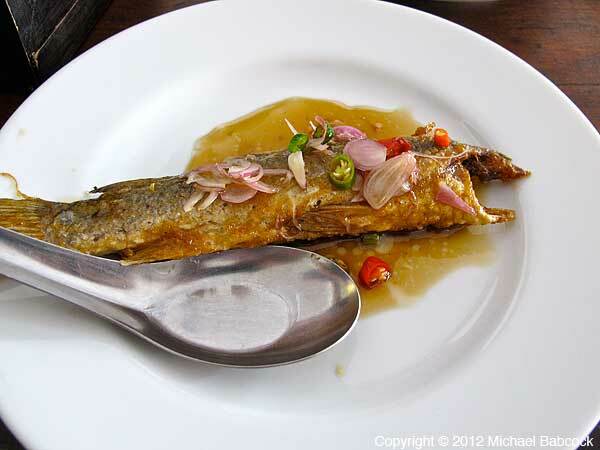 It is a particularly southern Thai dish, though there are apparently variations in Malaysia. 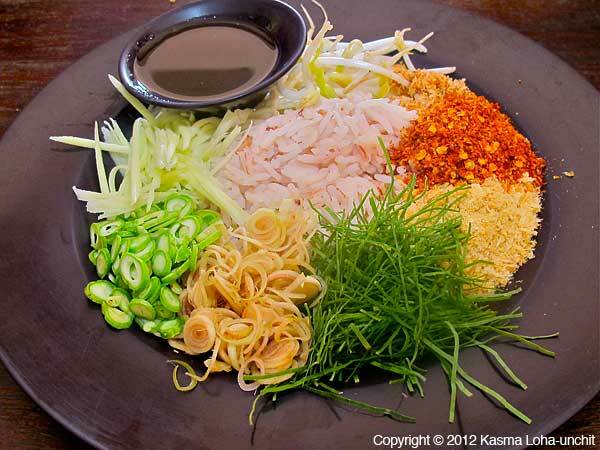 Kasma also teaches this in her Advanced Set E cooking class as Southern-style Rice Salad. 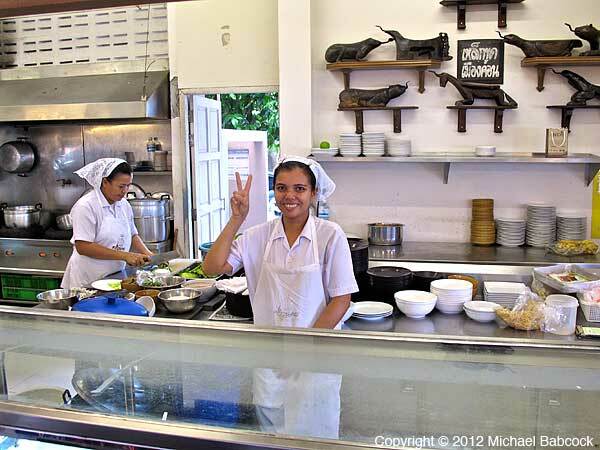 I recognize most of the staff from Krua Nakhon, including this smiling woman. Also brought over were the decorative antique coconut graters seen here in the background. 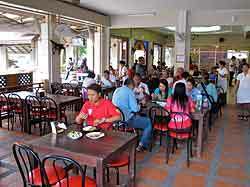 The interior remains open and bright, although open on 2 sides rather than 3 as at Krua Nakhon. Here are two of the counter areas where food is served. In southern Thailand, expect to get a plate of fresh vegetables, such as the one to the left, with your meal. 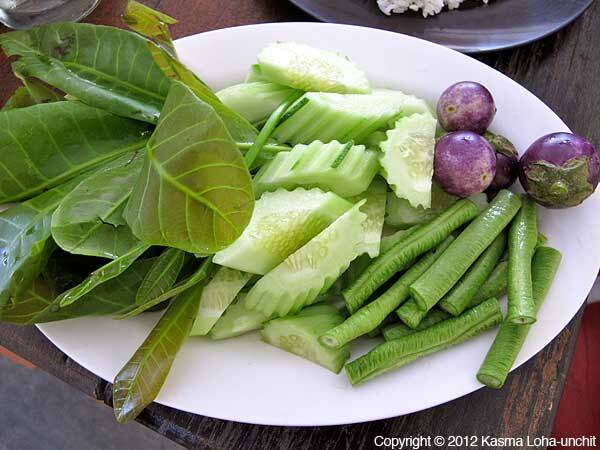 In addition to the more usual long beans, cucumbers and Thai eggplants, you’ll often find various leaves: I believe the leaves to the left of the picture are cashew leaves. 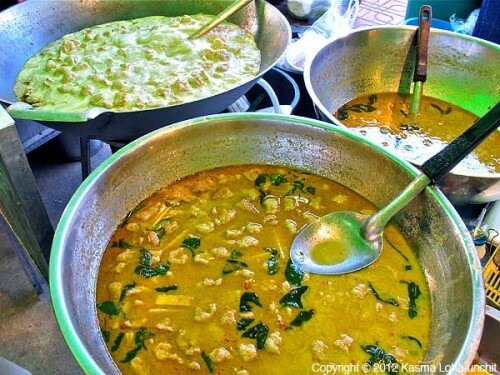 The dish to the right is Sour Curry – แกงส้ม (Kaeng Som). In other parts of the country, the southern version of Sour Curry is often called Yellow Curry – แกงเหลือง (Kaeng Leuang) – to distinguish it from the northern version of Sour Curry – they are quite different. There’s a good Bangkok Post Article: “Kaeng Som” A Thai Culinary Classic by Suthon Sukphisit. The dish on the left is a red-curry based crispy fried fish. 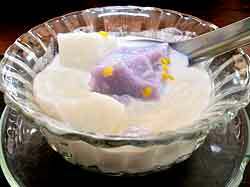 To the right is one of the many desserts available at Wang Derm; this one is served in sweet coconut sauce. Be warned though, they do run out of the desserts so you might want to select one early on. 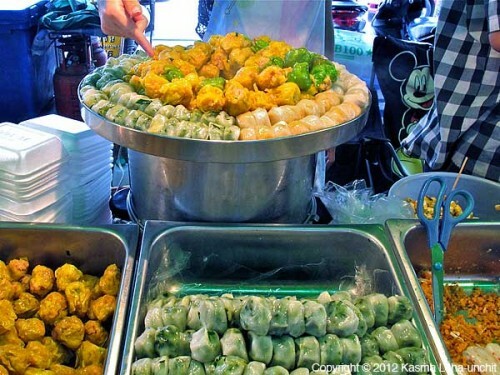 The yellow bits on the dumpling in the center are fried mung beans. Here are two views from the outside of Wang Derm to help you find the restaurant. If you’re in Nakhon Si Thammarat, give it a try for breakfast or lunch for delicious, fresh southern-style Thai food. Written by Michael Babcock, June 2012. 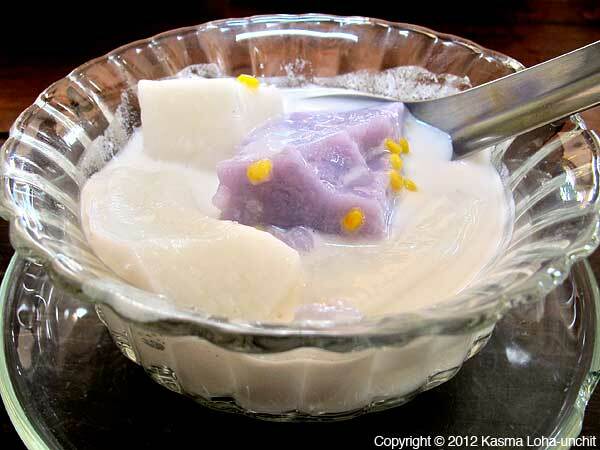 You are currently browsing the Thai Food and Travel Blog blog archives for June, 2012.